With Halloween just around the corner, fear is in the air. I can say, without a doubt, that All Hallow's Eve counts among my favorite holidays. I mean, not only do you get more candy than you can shake a stick at, but you've an excuse to dress up, go out, and scare yourself out of your wits. In hindsight, that last one's a little strange, isn't it? There's a very large camp of men and women - myself among them - who enjoy being frightened...but why? I know I've plenty of friends who don't understand that drive; plenty of folks I know think me something of an odd duck for willfully seeking terror. I'm not entirely certain why I do it myself, come to think of it. I suppose there's just something invigorating about fear and it's aftermath; you rarely feel more alive than when your fight-or-flight instincts are triggered, after all. In the interest of terror, I've found that few things are more frightening than a well-crafted horror game. There's a sense of immersion present that simply isn't present in other forms of media. 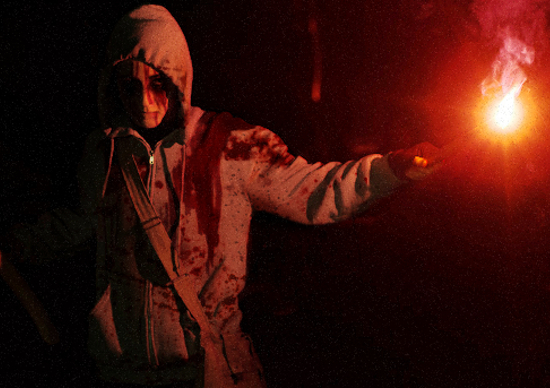 You're not just a passive observer in a horror game; you're actively experiencing things in-game. Basically, if you're looking to scare yourself, you could do a lot worse. I'd strongly urge those of you who are gamers - and even those of you who aren't - to give at least one of these games a try this Halloween. 'Tis the season, after all. We'll start with one that most of you have probably heard about. 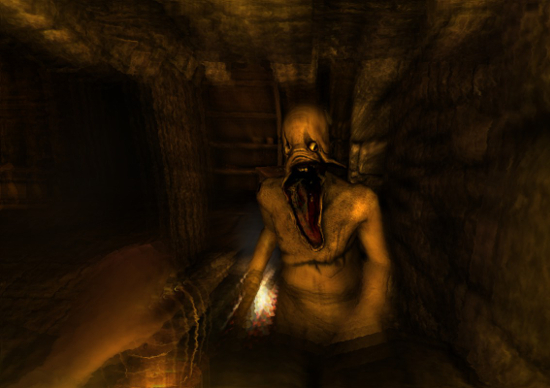 Amnesia: The Dark Descent stands easily among the best horror titles I've ever played. You're put into the shoes of Daniel - an amnesiac on the run from a Lovecraftian horror - as he makes his way through Castle Brennenberg in an effort to untangle his past and defeat his former associate, Alexander. To say that the game is a harrowing, psychologically draining experience is putting it lightly. You are alone. You are helpless. You face forces before which you're little more than an insect. 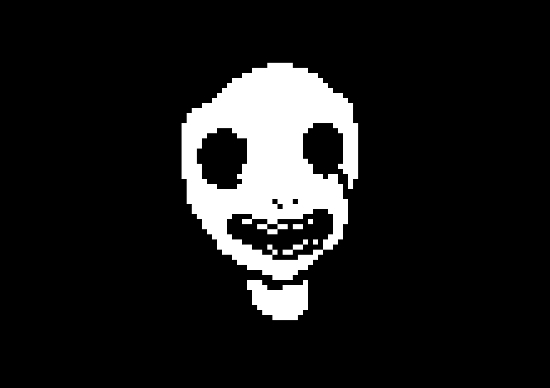 You'll desperately flee from monsters against which you've; the very sight of the beasts will cause your character's sanity to drain (resulting in blurred vision and frightening hallucinations, among other effects). I've heard a lot of people saying A Machine For Pigs isn't as frightening as the original. I disagree. To me, it's simply a different breed of horror from the first game. 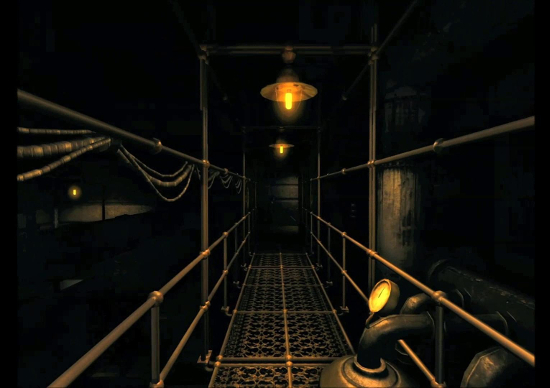 Whereas Amnesia made you feel frightened, hunted, and panicked; A Machine For Pigs did a fantastic job of causing the player to experience a sort of perpetual anxiety. Containment Breach is a free horror game based on a collaborative writing site known as the SCP Foundation. For the uninitiated, The Foundation is basically an organization tasked with tracking down, containing, and researching supernatural entities. You're put into the shoes of a lowly Class D employee (basically, an expendable guinea pig). 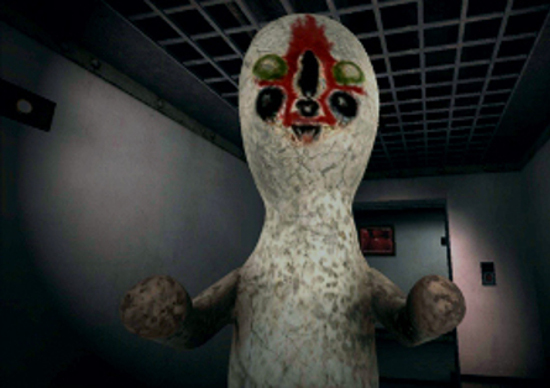 As the game starts, you've been sent to clean the enclosure in which SCP 173 (a goofy looking concrete statue) is contained. This creature has a rather unique quality: while it'll kill anyone it can get its hands on, it cannot move while someone is maintaining direct line of sight with it. Have I mentioned the game simulates blinking? Naturally, things almost immediately go south - the entire facility loses power, and t`he lights go off in the enclosure. 173 is set loose, and you're left alone in an area 51-esque facility filled with otherworldly beings whose only desire is your gruesome death. Even better, it's completely free. 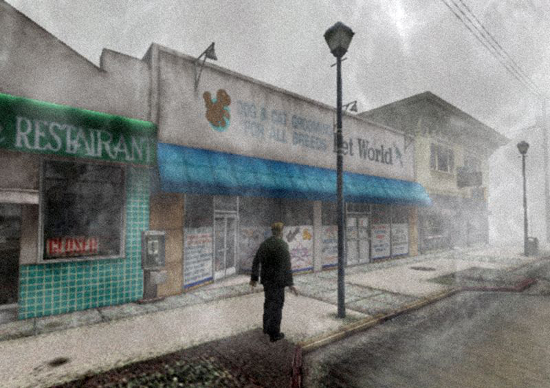 Cry of Fear is a single-player psychological horror mod designed for Half-Life 1. In spite of its age, it's more than worthy of its place on this list. The monsters are some of the most grotesque I've ever seen, the atmosphere is confusing and ominous to the point of anxiety, and the story is superb enough that one might think it professionally written. Even though Cry of Fear features both weaponry and an inventory system, that won't help you feel any less hunted, or any less safe. The monsters here are terrifying even to one who isn't completely defenseless. 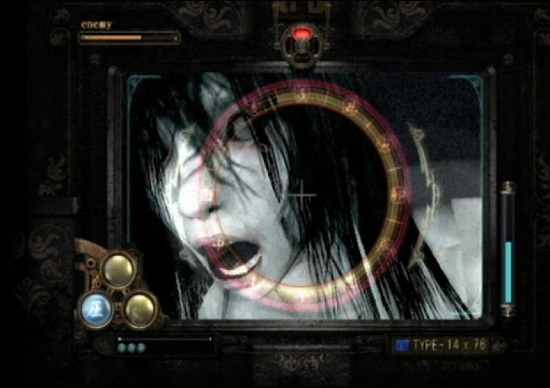 I've been told by many that Fatal Frame II (Project Zero in Europe) is one of the scariest video games ever made; it's one of those rare few titles that manages to do everything right. 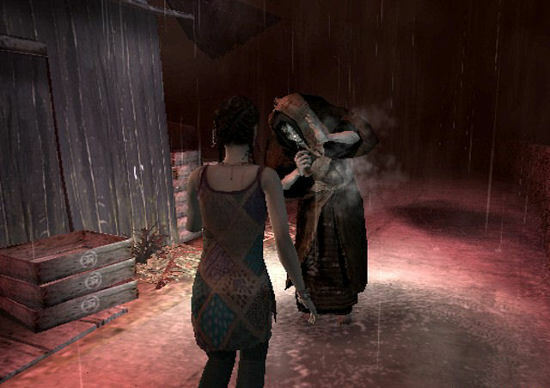 The game's setting - a village in which the torture souls of the dead are trapped for eternity - is downright unsettling, and the Camera Obscura - a mechanic by which you do battle with ghosts by capturing their image - throws jump scares out the window, instead forcing players to stare for seconds at a time at some of the most gruesome images they'll ever see. 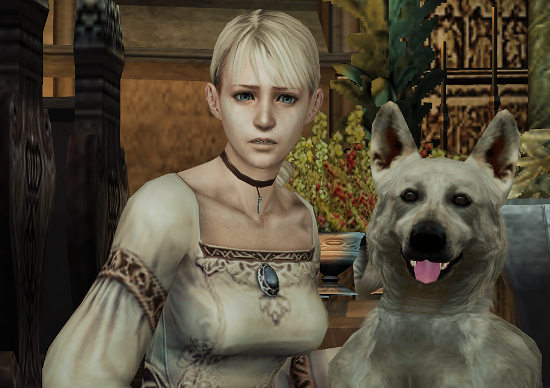 Haunting Ground is the touching story of a girl and her dog. And a gigantic, deranged groundskeeper. And a psychotic artificial maid. And an old man who wants to use said girl as part of some warped breeding program. Yeah, it's a pretty messed up game. Another horror game from an era long passed, Forbidden Siren was born from the same twisted mind that gave us Silent Hill; Keiichiro Toyama (that should give you an idea right out the door of what kind of game it is). It's set in a small, rural town three days after a devastating earthquake, and follows the story of ten survivors of the disaster as they fight for their lives in a desperate bid to discover the root of the disaster - and the source of the wandering Shibito (basically, undead abominations). The ability to look through the eyes of your aggressors' is a nice touch, while the atmosphere is remarkably grim and oppressive. Admittedly, I wasn't entirely sold on the idea of Lone Survivor when I first picked it up. How could a platformer possibly be frightening? As I started to get into the title, however, I realized something - 9/10 of what makes a good horror game is the psychological element; something Lone Survivor has in abundance. 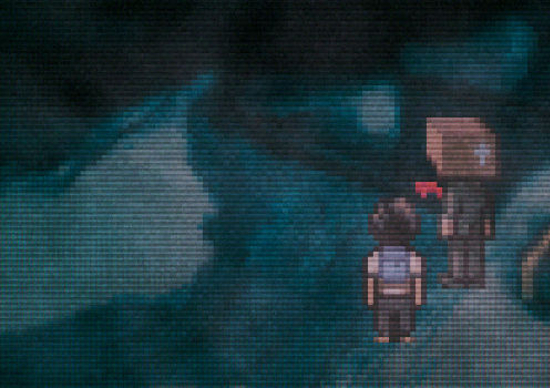 In Lone Survivor, You're the only survivor of a mysterious plague, tasked with wandering the halls of an abandoned, mist-shrouded apartment complex. Right from the beginning, something about the game's setting seems markedly 'off;' it's a feeling that only grows as you progress further. It's a sort of creeping unease that remains gnawing at the back of your mind, no matter what you do. There's a very real sense of isolation, and the monsters present in the complex are somehow downright terrifying by the way they move and behave. Last, but certainly not least, we've got a curious little title known as imscared. The graphics are pixellated and extremely simple and the game file takes up barely any space. Sound is digitized. Somehow, the whole thing still manages to be incredibly unsettling - almost as though you're playing through a horror story. Give it a try. It's free, and it doesn't even take that long to play through. I think. Got any other recommendations for games you feel I've missed? Give me a shout in the comments! Social Media Skewered By DFW FOX Station Amidst Gunfire & Mayhem!